Handy packaging that is microwaveable to be able to heat up meals in a very short time; packaging that is visually appealing, presents the content well, helps to increase the durability, and contains the intensity of flavor over a long period of time; packaging that is light but also easy to handle: These characteristics already belong to the every-day life of consumers. Accordingly, the pressure on producers of films to meet the continuously rising requirements regarding optics, handling and barrier properties, as well as conservation of resources and sustainability is high. Requirements do not only increase for flexible packaging films but also for bags and sacks, shrink and stretch films, agricultural films, and other films. But the efforts are worth it: Sales of packaging films will presumably reach a volume of approx. USD 250 billion until 2024. The market research institute Ceresana analyzed the global market for plastic films of all kinds already for the second time. In defining films, plastic sheets, and boards, all products from wafer-thin films to thick, rigid boards can be found. The focus in the present study is on flexible films. These include, for example, packaging for foodstuffs but also for non-food products such as textiles, stationary, and industrial goods. Additional analyses are provided of the application areas bags and sacks, shrink and stretch films. Besides the packaging market, other segments play a major role as well, especially agricultural films, construction films, films for office and stationary goods, technical insulation films, as well as other industrial films. This study does not cover sheets and boards as used in the manufacturing of rigid packaging, e.g., boxes, cases, and cartons. Rigid sheets and boards utilized in construction and industrial applications are not included, either. Product individualization does not only occur on the level of the actual consumer good but also to a large extent in the segment packaging (for example the campaigns for Coca Cola or Nutella). Since digital printing systems nowadays do not need any complex printing plates and become more and more efficient, completely new possibilities for packaging design arise. Requirements for the optimal use of digital printing are, however, films that are able to be printed on easily, fast, and optically of high quality. Biaxially oriented PET films (BOPET films) show a high transparency, high-quality optics, and a high tensile strength - very thin and light films can be made from this material. For even more reductions of thickness and weight of films (downgauging), BOPET plays a major role. BOPET helps to increase the durability of perishable food with its barrier properties and is, for example, used for aroma-proof packaging. Thin BOPET films of about 8 to 50 µm are mainly used for FMCG (fast-moving consumer goods) packaging, thicker films of up to approx. 350 µm are rather used for stationary or electronic goods. Biaxially oriented polypropylene films (BOPP films) are mainly utilized for foodstuffs packaging. However, BOPP films are not readily heat sealable. As this is a prime requirement for packaging films, BOPP is normally given a surface coating of a heat seal-able polymer such as a coextruded PP random copolymer. Copolymers for heat seals need to exhibit a high gloss and transparency. Coating or coextrusion increases the barrier properties of BOPP film, decreasing its permeability to gases. Common barrier polymers are ethylene vinyl alcohol, polyvinylidene chloride, and polyamide. Hot sealable BOPP films can be used for, e.g., packaging of foodstuffs, baked goods, snack products, pastas, dried fruits, potato products, stationary, textiles, cosmetics,and medical products. Analysts of Ceresana expect a growth of, on average, 4.0% per year in the upcoming eight years for BOPP films. Besides the trends of the FMCG packaging market, numerous other factors influence the demand for plastic films on several national markets as well. For example, many countries try to contain the demand for disposable carrier bags. Demand for secondary and transport packaging such as shrink and stretch films depends to a large extent on the macroeconomic development and the consumer climate of the respective country. In some countries, the efforts to intensify the agriculture propel the use of agricultural films. And, last but not least, the demand for construction films is closely related to the order situation of the individual construction industries. Since all of these factors can vary considerably from country to country, the present study gives an overview in the respective country profiles (chapter 2.1.1 to 2.5.5). Chapter 1 provides a thorough presentation and analysis of the market for plastic films – including forecasts up to 2024: The development of demand (tonnes), revenues (dollar and euro), as well as production (tonnes) is depicted for each region. Chapter 2 examines 18 countries in more detail: France, Germany, Italy, Spain, the United Kingdom, Poland, Russia, Turkey, Canada, Mexico, the USA, Argentina, Brazil, China, India, Japan, South Korea, and Thailand. Data on demand, revenues, and production split by types of plastics (LDPE, LLDPE, HDPE, PP, PET, PVC, other plastics) as well as import, and export is provided for each country. On the one hand, demand is analyzed in regard to application areas, on the other hand, for the particular types of films (PE, PP, PET, PVC, other plastics). 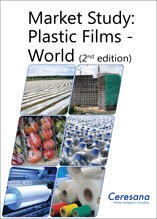 Chapter 3: Here, the focus is on the several application areas "packaging films", "bags and sacks", shrink and stretch films", "agricultural films", and "other films". The individual sales markets are presented on a regional and country level. In chapter 4, the demand for the individual types of films on a regional and country level is depicted. The demand for films made of polyethylene (PE), polypropylene (PP), polyethylene terephthalat (PET), polyvinyl chloride (PVC), and other plastics is examined in particular. Chapter 5 provides profiles of the largest manufacturers of plastic films, clearly arranged according to contact details, turnover, profit, product range, production sites, and profile summary. Indepth profiles of 97 manufacturers are given, including Bemis Company, Inc., Berry Plastics Corporation, British Polythene Industries PLC, Coveris, DuPont (E.I.) De Nemours, Exxon Mobil Chemical Company, Innovia Films Ltd, Klöckner Pentaplast Group, RKW SE, Sinopec Shanghai Petrochemical Company Limited (SPC), and Treofan Germany GmbH & Co. KG.